Yesterday we closed at a five-day high in SPY; today we closed at a five-day low. That's quite a reversal. I decided to consult the historical record and see what tends to happen next. Perhaps the main finding is that this is a rare occurrence. I found only 9 such instances since January, 2003 (N = 790). That means that we need to take any analysis with multiple grains of salt. Two days after the market made its five-day low (after having just made a five-day high), SPY was down by an average .17% (3 up, 6 down). That's quite a bit worse than the average two-day gain of .09% for the sample overall. I have yet to compile my Demand/Supply numbers, but if they're as negative as I expect, that too would bode poorly for the bulls in the short run. Keep an eye on the Trading Psychology Weblog later tonight, and I'll have those numbers posted along with a brief analysis. For those who have requested the link, here is the article on first hour patterns in trading. The relationship between the energy sector and the broad market indexes is a bit complicated. On one hand, you'd expect falling energy prices to benefit the economy and stocks. On the other hand, energy issues are well weighted within the major averages. For instance, since March, 2003 (N = 746), I find the correlation between the S&P 500 Index (SPY) and the energy ETF (XLE) to be .42. While this is significantly positive, it is lower than the correlations we see between many sectors and SPY. We currently have an interesting situation in which SPY is up over the last four days by a little over three quarters of a percent, but XLE is down about 2.5%. Because such a move in different directions is relatively rare, I decided to take a historical look at what typically happens afterward. Since March, 2003 (N = 746), we have had 111 occasions in which XLE has been down by more than 2% over a four-day period. Over the next four days, SPY has averaged a gain of .53% (72 up, 39 down). This is considerably stronger than the average four-day gain of .20% (359 up, 276 down) for the remainder of the sample. Even more strikingly, we've had 32 days in which XLE has been down by 2% or more and SPY has been up over that period. Four days later, the average gain in SPY has been .83% (22 up, 11 down). This strength carries over to eight days out, with SPY up by an average 1.62% (27 up, 6 down). That is quite an edge. It thus appears that strength in the S&P at a time of falling energy stock prices is bullish 1-2 weeks out. We'll count this one for the bulls going forward. On the Trader Performance blog, I recently posted an entry that looks at the process of defining and managing trade ideas from the perspective of lean manufacturing. One of the things I'm finding is that it is less difficult than I thought to identify trades that have a meaningful directional edge. If you have a good set of predictive measures, employ them properly over a truly representative lookback period, and then ensure that the relationships you identify apply to the entire lookback period, you can define an edge. The problem is managing this edge. Let's say, apropos of my last analysis, that you find that a trade has a significant positive directional bias over the next ten days, with many more winning trades than losers. The question then becomes, over the next ten days, how do you determine whether or not the trade continues to possess its favorable edge? Suppose the market drops during the first two days of the trade period: do you continue to hold, add to the position, or exit? This is partly a question of risk management, but also a question of odds. If the two-day dip actually increases the odds of the trade going your way, exiting in the name of risk management seems perverse. It would be far better to start out with a position size that allows you to weather such adverse movement. What I'm currently working on is something I call "sequence analysis". I examine every historical trade identified in my analyses and then walk them forward to identify the normal sequences of profits and losses. I'm specifically looking for key events that separate the winning trades from the losers, so that these could serve as rational exit points. To give but one simple example, if I find that 85% of all winning 10-day trades started out by being profitable in the first two days, I might not want to hold a loser after two days. Sequence analysis becomes much more interesting and complex when you utilize predictors not in the original analysis to evaluate the likelihood that a historical pattern will repeat itself. For example, I might forecast a favorable ES over the next ten days based on the relative movements of Speculative and Non-Speculative stocks. My sequence analysis, however, may reveal that the vast majority of profitable trades occurred when the Adjusted TICK was positive in the first day of the 10-day period. That provides me with a tool for managing the trade. Do I really want to hold beyond the first day if the TICK is negative? Might I add to the trade if I see strength in the TICK? We spend a lot of time studying entries, less time studying exits, but very little time truly studying the criteria that should keep us in or out of a trade. We might know the odds of success at the time we enter a trade, but can we update those odds based on current market movement to tell us whether to scale in or out? Sequence analysis would provide a rational basis for such updating, turning the management of trades into a lean process. What I'm finding in the very large baskets of Speculative and Non-Speculative issues that I am tracking is that they are more predictive of large index performance (such as ES, SPY, QQQQ, NQ) over longer timeframes than shorter ones. This has interesting implications for managing a trading portfolio to maximize opportunity. Increasingly I'm seeing where the common strategy of holding positions intraday only to minimize risk also minimizes important opportunities. Let's take the current situation as an example. My basket of Speculative stocks is slightly down on the week. The Non-Speculative stocks, however, are up by over half a percent. Going back to March, 2003 (N = 743), I found 66 occasions in which the Spec stocks are down on the week by less than .40%. Ten days later, the S&P 500 Index (SPY) has been up by an average of .31% (41 up, 25 down), no different from the overall sample. If we divide the sample in half based on the relative performance of Non-Spec stocks, a pattern emerges. When the Spec stocks are mildly weak on a five-day basis, but the Non-Spec stocks are strong (as at present), the next ten days in SPY are up by only .09% (17 up, 16 down). When the Spec stocks are mildly weak, but the Non-Spec stocks are weak, the next ten days in SPY are up by a whopping 1.22% (24 up, 9 down). With the Non-Spec stocks leading the way at present, we'd have to count this as one for the bears going forward. We can see, however, that at holding periods of up to two weeks, the relative performance of Speculative issues and Non-Speculative issues seems to make quite a difference. Time Frame - A sector may be unrelated to an index on a very short-term basis, but still be predictive further out. For instance, many of the analyses are more powerful when predicting several days out than predicting next day. Whether the Predictor Sectors/Markets Are At Extremes or Moderate Values - Most often, a sector will not be equally predictive at very high and very low levels (extreme values) and at moderate levels. Analyses need to focus on a relevant segment of a predictor's distribution (a range of values similar to the current values), not the full distribution. Here's a good example. We recently saw a leading relationship between the semiconductor stocks and the S&P 500. As of Friday's close, the semiconductor stocks (SMH) was down sharply on a two-day basis (down over 1.5%), while the NASDAQ 100 Index (QQQQ) was unchanged. In this situation, the SMH weakness ends up not leading the QQQQ lower. After a sharp two-day drop, most the indexes tend to rebound, which in this case would benefit the QQQQ. We see that, since March, 2003 (N = 749), there were 90 days in which the two-day QQQQ neither rose nor fell by more than .20%. The next four days in QQQQ averaged a gain of .32% (51 up, 39 down), not significantly better than the average two-day gain of .30% for the sample overall. When we split the sample in half based on SMH performance over the two days, we see a pattern. When SMH has been strong, the next four days in QQQQ average a gain of .11 (24 up, 21 down). When SMH has been weak (as recently), the next four days in QQQQ average a gain of .53% (27 up, 18 down). An examination of the data suggests that this occurs primarily because of a bounce back in SMH, which helps QQQQ. What we're seeing is evidence of complexity. Trading relationships among sectors, stocks, and markets is not so simple as saying, "A leads B." One must specify the conditions under which there is a leading relationship. I have been encountering this same complexity with the earlier mentioned Speculative stocks and will report on that this weekend. Here's another look at a market sector that has been exerting a lead relationship vis a vis the S&P 500 (SPY). It's the Broker-Dealer Index (XBD), which tracks the stocks of brokerage houses. One would think that if the XBD is healthy, that's a vote of confidence for the markets, and that should translate into favorable price action for SPY. Over the past four days, we are essentially unchanged in SPY, but XBD is up by over 1%. I went back to March, 2003 (N = 744) and found 84 occasions in which SPY was neither up nor down more than .20% on a four-day basis. Over the next eight days, the average gain in SPY was .48% (52 up, 32 down). This compares with an average four-day gain in SPY of .50% (448 up, 296 down) for the sample overall. Clearly no great edge there. When I divided the sample of little-changed SPY days in half, however, based on XBD performance, a pattern emerged. When XBD was strong, the next eight days in SPY averaged a very solid gain of .96% (31 up, 11 down). When XBD was weak, the next eight days in SPY averaged unchanged (21 up, 21 down). This suggests that bullish performance in XBD tends to anticipate bullish performance in SPY after we've had a narrow four days in the large caps. We'd have to count this as one for the bulls going forward. Under conditions of perceived risk and uncertainty (after all, what we react to is what we perceive) we no longer process information in our accustomed ways. At a brain level, regional cerebral blood flow shifts from the frontal cortex (our executive center) to motor centers that facilitate those famous flight or fight responses. This denies us access to our usual good planning, judgment, and decision making. As a result, we can end up making decisions that we look back upon in amazement: "What was I thinking?!" The answer, of course, is that we *weren't* thinking at the time. We were reacting: managing our perceptions of threat rather than the objective trades in front of us. Effective brief therapy for traders enables them to reprocess perceptions of risk and uncertainty, so that the blood shifts--and the associated state shifts that generate anxiety, frustration, and impulsive behavior--cannot occur. My book The Psychology of Trading was an effort to explain this process and provide basic tools and techniques for traders to use under conditions of heightened risk and uncertainty. In the new book I'm currently writing, I will provide actual "therapy manuals" to help traders become their own therapists. Anticipating market movements from historical studies provides a valuable edge in trading, but any edge is worthless if our states of mind prevent us from acting upon the information effectively. My hope is that the articles on my personal site, as well as the book, provide traders with some help on that front. It's about 9 AM Chicago time as I'm writing this. The QQQQ opened higher this AM, but SMH was down on the open and some size was hitting bids in the semis. I know that there is a lead-lag relationship currently operative between "SOX and Stocks" so that alerted me to fade the opening strength rather than go with it. That trade idea paid out almost immediately in the first half hour. Here's a further analysis: I looked back to March, 2003 and found 93 occasions in which the difference between SMH opened .5% or more weaker than QQQQ. From that open to the next day's close, the average price change in QQQQ was -.17% (38 up, 55 down), weaker than the average gain of .08% (380 up, 368 down) for the sample overall. Once again, we see SMH leading a relationship with a major stock average. Applying these relationships to the proper time frames of trading is a big part of using them successfully. And, of course, one must keep in mind multiple lead-lag relationships, not just one involving a single trading instrument. When we see multiple leading relationships pointing the same way, that's when you can have real confidence in a trade idea. Much of my recent research posted here and on the Trading Markets site has dealt with lead-lag relationships in the market: identifying sectors that lead the major market indexes. One of my earliest investigations in this area was in an article I called "The SOX and the Stocks", in which I found that semiconductor stocks led the S&P 500 index. I noticed today that, on a five-day basis, the S&P (SPY) is up by more than 1.6% but the semiconductor issues (SMH) is down by 1.35% over that same period. I decided to update my study by seeing what happens when these averages travel in different directions. Since March, 2003 (N = 740), we have had 243 days in which SPY has been up more than 1% on a five-day basis. Five days later, SPY has averaged a gain of .17% (139 up, 104 down), considerably worse than the average gain of .30% (431 up, 309 down) for the sample overall. When SPY has been up by more than 1% and SMH has been down more than 1% (N = 18), the next five days in SPY have averaged a loss of -.20% (9 up, 9 down). When SMH has been up more than 1% while SPY has also been up, the next have days in SPY have averaged a gain of .25% (109 up, 74 down). It thus appears that strength in SPY is less likely to continue if it is not matched by strength in SMH--a factor we have to count as mildly bearish going forward. Interestingly, I have found this relationship to hold on an intraday basis as well: It was the failure of SMH to break its previous day's highs early today that first alerted me to the possibility of a selloff. This past week we saw the S&P 500 rise about 1.7% in a five day period. The performance of the Spec stocks was very similar. I decided to extend the recent investigations to a weekly basis by seeing what happens one week after a week in which SPY is up more than 1.5%. Since March, 2003 (N = 744), we've had 156 days in which SPY has been up more than 1.5%. Five days later, the average gain for SPY has been .23% (91 up, 65 down), which is not greater than the five day average gain of .30% (435 up, 309 down) for the sample overall. When we break the strong SPY days in half based on the relative performance of the Spec stocks, we see a similar pattern to one we've noticed with the daily data. When SPY is up more than 1.5% and Spec stocks are strong, the next five days in SPY average a gain of .35% (48 up, 31 down). When SPY is up strongly and Spec stocks are weak, the next five days in SPY average a gain of only .12% (43 up, 36 down). I continue to refine my universe of Speculative and Non-Speculative issues and need to conduct more analyses with the Non-Spec group. Given that Spec stocks did not outperform SPY this past week, there is no bullish edge from this direction for the coming week. On a separate note, check out my upcoming article for Trading Markets, which investigates SPY performance as a function of the Japanese market. I've also posted additional trading resources to the Trader Development page on my personal site. Continuing the investigations of the past couple of days, I redefined my Speculative and Non-Speculative stock universe to focus on larger companies more similar to those within the S&P 500. I also decided to compare Spec stock performance to the S&P 500 performance itself, rather than to Non-Spec performance. In this study, I went back to March, 2003 (N = 746) and found 75 days in which SPY was up by 1% or more. Two days later, SPY was up by an average of .12% (44 up, 31 down). This is not significantly different from the average two-day gain in SPY for the sample overall: .12% (407 up, 339 down). When I divided the strong SPY occasions in half, however, based on the relative performance of Spec stocks vs. SPY, a pattern again emerged--one compatible with my original hypothesis. When Spec stocks were strong, the next two days in SPY averaged a gain of .28% (24 up, 13 down). When Spec stocks were weak, the next two days in SPY averaged a loss of -.03% (20 up 18 down). It thus appears that strength in the S&P 500 is more likely to continue in the short run when speculative stocks are outperforming the broad market. When speculative interest lags, strength in SPY is less likely to persist in the near term. Using the same sample, I then looked at occasions when SPY was down by 1% or more (N = 72). Overall, when SPY has been weak in this manner, the next two days in SPY have averaged a gain of .30% (37 up, 35 down), stronger than the average two-day gain for the sample of .12% as outlined above. When I divided the sample in half based on the relative performance of the Spec stocks vs. SPY, the pattern was more muted. When Spec stocks were relatively strong, the two days following a weak SPY averaged a gain of .36% (18 up, 18 down). When Spec stocks were relatively weak, the next two days averaged a gain of .23% (19 up, 17 down). My next studies will look at the Non-Spec stocks; then I will extend the analyses to multi-day patterns. To follow up on the Speculative and Non-Speculative stock research from my last posting, I decided to look at up days in the S&P 500 (SPY) and whether the relative performance of the Spec and Non-Spec stocks (many of which are not stocks in the S&P large cap universe) made a difference in future performance. Since April, 2003 (N = 715), we had 69 days in which SPY was up by 1% or greater. Overall, the market was up by an average of .21% three days later (46 up, 23 down), a bit better than the average three-day gain of .16% (423 up, 292 down) for the sample overall. I then broke the strong SPY days in half based upon the relative strength of the Spec stocks vs. the Non-Spec issues. (See yesterday's blog entry for a description of these stocks). To my surprise--and contrary to my initial hypothesis--when the Spec stocks were relatively strong, the next three days in SPY averaged a gain of only .05% (23 up, 12 down). When the Non-Spec stocks were relatively strong, the next three days in SPY averaged a gain of .36% (23 up, 11 down). This suggests that strength in SPY is more likely to continue in the near term if Non-Speculative stocks (some of which are highly weighted in the S&P) are strong relative to Speculative issues. When I examined weak S&P days--those down by 1% or more (N = 67) in the same sample--another interesting pattern emerged. Overall, when the market is down by over 1%, the next two days in SPY average a gain of .26% (34 up, 33 down). This is modestly better than the average two-day gain for the entire sample of .11% (392 up, 323 down). When we divide the weak SPY days in half based on the relative strength of the Spec stocks, the results are eye-opening. When the Spec stocks are relatively strong during a weak day in SPY (N = 33), the next two days in SPY average a gain of .60% (20 up, 13 down). When the Spec stocks are relatively weak during a weak day in SPY (N = 34), the next two days in SPY average a loss of -.06% (14 up, 20 down). This is quite a difference. It suggests that the S&P is more likely to rebound from weakness in the near term if Spec stocks are displaying relative strength. If Non-Spec stocks are relatively stronger, the weakness in SPY is more likely to continue in the short run. In sum, a strong day in SPY is more likely to continue its rise if Non-Spec stocks are relatively strong. A weak day in SPY is more likely to reverse if Spec stocks are relatively strong. The latter effect appears stronger than the former. I have much more exploration to do with this measure. The relationship between the relative performance of Spec and Non-Spec stocks and future market performance appears to be more complex than I initially envisioned. There are meaningful relationships here, and the key will be to identify and explain them. I will post more on this topic on my Trader Performance blog tonight. The best market indicators, I've found, are the ones that are the least picked over. I can pretty much assure you that if an indicator can be readily created in a charting application, it is of limited predictive value. Been there, done that. Good indicators, on the other hand, are conceptually grounded and are not easily replicated. The Demand/Supply Index on my Trading Psychology Weblog is an example. It is a straightforward measure of momentum, but is so broad--covering every operating company stock on the major exchanges-- and is so calculation intensive (requiring prices and volatility estimates at two different time frames for each issue) that it's unlikely to appear any time soon on the indicator menu of a trading app. The indicator I'm working on now has considerable promise for these reasons. I divide a very large stock universe into two components: speculative and non-speculative. Spec stocks tend to be more volatile in their price behavior, younger as firms, more volatile in their earnings, more likely to trade at high price earnings ratios, less likely to pay dividends, and less likely to have a large percentage of their shares owned by institutions. Non-Spec stocks are less volatile, more established as companies, more stable in their earnings, more likely to trade at lower price earnings ratios, more likely to pay dividends, and more likely to have significant institutional coverage. As a whole, Spec stocks show better growth than Non-Spec stocks, but this may be a function of survivor bias. There are plenty of Spec stocks that show earnings declines, and plenty of Non-Spec stocks that show steady earnings gains. In my first analysis, I created a synthetic market index consisting of half Spec stocks and half Non-Spec stocks. I then looked at occasions when price change in this index is narrow on the day (up or down less than .30%). Since April, 2003 (N = 715), we had 151 narrow days in the index. When the Spec issues were strong on those narrow days (N = 75), the next two days in the synthetic index were up by an average of .33% (47 up, 28 down). When the Non-Spec issues were strong on those narrow days (N = 76), the synthetic index over the next two days was up by an average of .03% (35 up, 41 down). What this means is that both Spec and Non-Spec stocks (the synthetic index as a whole) perform better when relative strength is on the side of the Spec stocks. This makes sense: when sentiment is favorable in the market, traders will prefer Speculative issues. When sentiment is cautious, traders will lean toward safer, Non-Spec stocks. There is much research to follow from this, including--of course--predicting the major market averages from the baskets of Spec and Non-Spec issues and creating a Spec Index indicator to track daily speculative sentiment in the market. I have a feeling this one is a winner. Check out the Trading Markets site Friday AM; I should have a detailed article on this topic posted then. Over the past three sessions, we are up more than 2% in both SPY and the banking stock index BKX. I decided to look at what happens when this is the case. Since March, 2003 (N = 743) we have had 50 days in which SPY has been up by more than 2%. Over the next five days, SPY has averaged a gain of .55% (33 up, 17 down), which is stronger than the average five-day gain of .30% (434 up, 309 down) for the sample overall. Interestingly, however, when SPY and BKX are both up more than 2% in a three day period (N = 36), the next five days in SPY average a gain of .95% (24 up, 12 down). When SPY is up by more than 2% in a three-day period, but BKX is up less than 2% (N = 14), the next five days in SPY average a loss of -.48% (7 up, 7 down). In short, the bullish prospects for SPY appear to be better when banking stocks are participating in market strength. We'll count this as a positive for the bulls going forward. Strong Stocks, Weak Oil: What Next? In the past two days, the S&P 500 (SPY) has risen by over 1.4%, while the oil and gas stocks ($XOI) have dropped by over 1.26%. My thought was that this configuration would be bullish for SPY, as it suggests a favorable outlook for companies in the face of falling oil prices. Since January, 2003 (N = 782), we have had 14 days in which the two-day SPY has been up by over 1% but the oil stocks have been down by .9% or more on a two-day basis. This is an unusual configuration, as daily price changes in SPY and XOI correlate by over .50. Five days later, SPY was up by an average 1.09% (10 up, 4 down). This is much stronger than the average five-day price change for the sample (.22%) and for periods in which SPY has been up by more than 1% over two days (.33%; N = 151). This is admittedly a small sample, and in the very near term, it has not paid to buy stocks after a two-day runup. Still, the non-oil components of the weighted large cap indexes must be strong to overcome the weakness in the energy issues--strength that appears to carry over to the following several days of trading. Readers of the Trading Psychology Weblog are familiar with the Demand/Supply measure, which is a proprietary indicator of momentum that I post daily to the site. Demand is the number of listed U.S. operating company stocks that closed above the volatility envelope surrounding both a short-term moving average and an intermediate-term average. These, therefore, are stocks with very strong price momentum. Supply is the number of issues that close below both averages. It is common for Demand and Supply to hit extremes prior to price peaks and valleys in the major averages. Since the start of the bull market (N = 729), we have had 44 days in which the Demand reading has exceeded 120. (Tuesday's reading was over 130, reflecting the solid rally; please note that these are normalized values, not raw figures). Three days after such strong momentum, the market was up by an average of .52% (33 up, 11 down). This is much stronger than the average three day gain of .18% (432 up, 297 down) for the sample overall. Strong upside momentum tends to persist in the short run: this finding has been valid throughout the bull market. This is the first of my attempts to carefully separate out the small and mid cap universes by comparing the S&P 400 small caps ($SML) to the S&P 600 mid caps ($MID). I went back to March, 2004 (N = 482) and found 77 occasions in which SML was down by more than 1%--as was the case on Monday. I then investigated whether the relative performance of MID vs. SML had any impact on future short-term performance. When SML has been down by 1% or more (N = 77), the next day in SML has averaged a gain of only .01% (41 up, 36 down). This offers no edge relative to the sample overall, which averages a gain of .06% (267 up, 215 down). I then broke down the weak SML days in half based on MID performance. When SML was much weaker than MID (N = 38), the next day in SML averaged .20% (24 up, 14 down). When MID showed greater relative strength (N = 39), the next day in SML averaged a loss of -.18% (18 up, 21 down). On Monday, SML was weak relative to MID, but not by a huge margin. Interestingly, it appears that, although SML and MID are highly correlated, relative weakness among the smallest stocks during a decline leads to a reversal, while relative strength leads to further weakness. Because the Russell 2000 Index has components of both small and midcap issues, a differentiation of these might be helpful in predicting ER2 performance. That will be an upcoming project. Friday's market closed only modestly higher after first dropping, then rising, and finally falling back toward its opening price. That had me looking at markets that are little changed but have above average daily trading ranges. Since March, 2003 (N = 734), we have had 198 days in which SPY has closed within .20% of its opening price. Three days later, the market is up by an average .29% (120 up, 78 down). This is stronger than the average change of .15% (313 up, 223 down) for the remainder of the sample. When we look at narrow SPY days as a function of volatility (daily range), however, a pattern emerges. When the range is wider (N = 99), the following three days average a gain of .40% (62 up, 37 down). When the range is narrower (N = 99), the following three days average a gain of .17% (58 up, 41 down). This suggests that wide range days with small price change have more favorable expectations than narrow days with small price change. Interestingly, this pattern has continued throughout the recent bull market. Of the 12 occasions since August, 2004 in which we have had a range above 1% and narrow price change from open to close, 10 have shown gains over the next three days, averaging .71%. We'd have to score this one for the bulls as we start the new week. 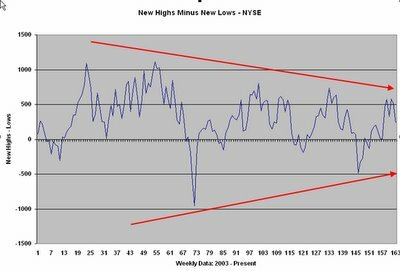 Here you can see weekly new highs minus weekly new lows for the NYSE, 2003 - present. The pattern is quite clear: we're seeing fewer stocks participate during market rallies, but we're also seeing modest levels of new lows. In all, this is consistent with low volatility market conditions, and it is also consistent with past bull market patterns. In general, we see several phases to a market cycle. The earliest phase of the bull is one of great momentum, with a majority of issues participating and making new highs. As the bull matures, we continue to see price highs for most indices, but a declining number of individual issues making new highs. Late in the bull market, new lows will expand, new highs will dwindle, and the indices will fail to make new price highs on rallies. This sets up a phase of bear market selling, with new lows consistently exceeding new highs--interrupted by brief short-covering rallies--followed by a washout period of capitulation in which new lows vastly outnumber new highs. Using this broad schematic, we can see that we're still in the phase of the bull where we have made new price highs but with decreased participation from individual stocks. It is normal to experience a pullback following such rallies; these bear swings are generally prefaced by an expansion in the number of stocks making new lows. As long as we do not see a more negative new high/low balance than was recorded at the October lows, I will not worry overmuch about the bull market. A signficant expansion of new lows would, IMHO, be of greater concern. The aging of the bull is generally also heralded by shifts in market leadership. We saw this during the market peak around 2000-2001. Speculative favorites give way to more defensive stocks as economic concerns come to the fore. The current collapse of such favorites as GOOG and YHOO, as well as the gold and oil stocks, is on my radar for that reason. In short, it looks to me as though we're in a mature bull market, but not one that is yet showing signs of imminent collapse. This doesn't affect my day-to-day trading outlook greatly, but is relevant to longer-term trading and investing horizons. I am very open to the possibility that the early January highs were the price highs for this bull market, but will not stay fixed in that view if the ES can sustain a low in the mid 1250s. 1) All such analyses provide hypotheses only, not conclusions. The historical analyses are not "right" if they are replayed in the upcoming markets; nor are they "wrong" if the historical odds are not manifested on the next occasion. The historical studies merely indicate what has occurred in the past and whether such occurrences have been skewed or not. Our job is to use this information as background and see if the obtained patterns are indeed playing themselves out in the market. As I mentioned in a recent article for The Traders Journal in Singapore, Pasteur's observation that "Chance favors the prepared mind" captures the intent of historical study. It is meant as preparation--not as a fixed opinion to get locked into. 2) Disconfirmed hypotheses also provide information. Excellent trade ideas can be derived once you identify that a market is behaving contrary to its historical norms. 3) The utility and validity of historical analyses depends not only on having clean data and a promising set of indicators to study, but also on selecting proper lookback periods. The patterns that were common during the 2000-2002 bear market are not patterns we've seen in the past 2-3 years. Nor will the patterns of 2008 replicate those of the recent past. Recently, we've seen that patterns that were strong early in the current bull market (2003-4) are no longer robust. This means that we must weight recent data more strongly and be open to the possibility that we are undergoing a market transition. Indeed, shifts of trending and volatility patterns are perhaps the best evidence we have that market cycles are shifting. 4) The utility and validity of historical analyses also depends upon lookforward periods. Forecasting directional tendencies 1-3 days in the future requires a different set of predictors than forecasting 1-3 months or years hence. Of particular importance is what I call the optimum predictive horizon: the time frame that is most reliably forecast with a given set of predictors. This horizon, which almost always is not intraday, can help one define a directional bias within which shorter-term trading can occur. 5) Historical analyses are best employed in combination, with different sets of predictors and timeframes. Occasions in which multiple analyses converge to yield similar directional biases provide very high confidence trade ideas. Occasions when multiple analyses generate no meaningful directional biases help alert us to markets where our edge might be slim to none. Much of total P/L comes from trading known edges aggressively and staying away from risk when there is no edge--something any good poker player knows. I will follow up with further thoughts on the Trader Performance blog of my personal site. Thanks for the many kind comments and suggestions I've received regarding the TraderFeed blog. Thursday's NASDAQ Index (QQQQ) turned in a reversal day, opening near the day's highs and closing near the lows. It was also a relatively wide range day compared to recent action, with a range slightly over 1.8%. We closed about 1.6% off the day's highs and .20% off the lows. I examined days since March, 2003 (N = 733) to identify past occasions when we've closed off the highs by more than 1.5% and off the lows by less than .30% (N = 66). Three days after these reversal days, the market was up by an average of .50% (38 up, 28 down), stronger than the .22% (416 up, 317 down) for the sample overall. When I broke the sample in half based on time, however, a pattern emerged. From May, 2004 to the present (N = 33), the average three-day change following a reversal day was .08% (18 up, 15 down). From March, 2003 through April, 2004, the average three-day change was .91% (20 up, 13 down). Interestingly, returns following the reversal day were superior when the prior day was weak rather than strong. Both of these patterns fail to provide us with favorable near term bullish edges and, indeed, suggest subnormal returns in the short run. Put/Call Ratio: Does It Make A Difference? I noticed that we continue to have a relatively high equity put/call ratio despite Wednesday's rise. The five-day put-call ratio is the highest we've seen in 2006. To see if the ratio makes a difference, I looked at all days since March, 2003 (N = 737) in which SPY was up over .5% and the one-day put/call ratio was over .75. Overall, we've had 191 days in which SPY was up over .5%. When the put/call ratio was over .75 (N = 37), the market three days later was up by an average .51% (24 up, 13 down). When the put/call ratio was below .75, however, the market three days later was up by a subnormal .03% (86 up, 68 down). It appears that rises have a better chance of continuing to the upside in the short run when sentiment remains bearish, as is the case at present. I will continue to investigate the equity put/call ratio and report results here and on my personal site. Note that this is the ratio for stocks only, eliminating the hedging bias from options transactions on indices. Tuesday saw a downside breakout and a loss of over 1.5% in the Russell 2000 stock average (IWM). I decided to look at what happens after large Russell declines of over 1.5% as a function of broad selling in the market. This selling, readers of my Trading Psychology Weblog know, is measured by the Adjusted TICK: the NYSE TICK adjusted for a zero mean. Since July, 2003 (N = 653), we've had 64 days in which IWM has been down 1.5% or more. The next day, IWM has averaged a loss of -.03% (32 up, 32 down), which is weaker than the average daily gain of .08% (353 up, 300 down) for the sample overall. When we divide the sample in half based on the Adjusted TICK, however, a pattern emerges. When the TICK is weak (N = 32), the next day in IWM averages a loss of -.22% (14 up, 18 down). When the TICK is strong (N = 32), the next day in IWM averages a gain of .16% (18 up, 14 down). Tuesday saw a TICK reading in the strong end of the sample, suggesting lesser odds of carryover selling on Wednesday. Interestingly, when we look three days out after a weak day in IWM, expectations have been favorable. The market has averaged a three-day gain of .51% (39 up, 25 down), better than the average gain of .22% (384 up, 269 down) for the sample overall. In general, buying weakness after a weak day in IWM has been a solid strategy during the bull market. Monday was a slow day in the market, with the NASDAQ 100 (QQQQ) Index moving in a roughly 1% range--about 2/3 the norm. The QQQQ also traded at about 70% of its average volume over the past 60 days, closing down .22% from open to close. I decided to take a look at slow, narrow days in QQQQ by going back to March, 2003 (N = 737) and investigating days in which the range was less than 1.2% and volume was 80% of the 60 day average or less. This provided a sample of 105 occasions. As we might expect, the next day in QQQQ also tends to be slow. Fully 76 of the 105 occasions were below average in volume. This tended to produce reduced trading ranges; 74 of the occasions were below average in trading range. Interestingly, when the narrow, slow day was down (N = 42), the market fared better the next day (average gain = .14%; 26 up, 16 down) than if the narrow slow day was up (N = 63; average loss = -.03%; 27 up, 36 down). In short, narrow slowness tends to carry over to the next day for QQQQ, but price movement on the narrow slow day tends to reverse the following day. I just submitted an article that should appear Monday AM on the Trading Markets site. This one looked at two-day declines of more than one percent and the returns expectable as a function of day-of-the-week. The bottom line was that, since 2003, Mondays, Tuesdays, and Fridays returned much better results than Wednesday and Thursday. Indeed, the latter two days barely were profitable. What was most interesting was that I obtained these exact same results from S&P 500 data going back to 1995. It is very difficult to believe that this is pure chance--occurring as it does over independent data samples going back over a decade--yet it is difficult to explain why certain days should perform differently from others. Would we see similar findings for market rises? For other time frames? Clearly this is an area that warrants further investigation. For what it's worth, weakness early in the week is particularly associated with reversals; weakness at the end of Wednesday or Thursday is not. Buying weakness at the end of Monday has worked particularly well since 2003. I will be following up on my personal site. Days of the Week: Do They Make a Difference? Traders often refer to Fridays as bad trading days...Mondays fare almost as poorly in their reputation. But are there real differences in trading patterns from day to day? I went back to January, 2003 and investigated results for each day of the week. My first finding was that volatility was about the same for the various days. There was no evidence that any particular day of the week had more movement than any other. Since the beginning of 2003, we have gained almost 400 S&P points. Close to 70% of this total occurred on Monday and Tuesday. Wednesday showed very slightly negative returns, Thursday had the third best performance, and Friday was barely positive. Over 90% of all market gains since 2003 have occurred on Monday, Tuesday, and Thursday. As you might guess, the best returns came from buying at the end of Wednesday and holding through Monday (.18%) or buying the end of Thursday and holding through Tuesday (.19%). Buying a down Friday and holding through Monday (a strategy that applies to the current market) has been quite a winning trade idea: average one-day price change is .21 (47 up, 24 down). Friday's market gave us an opportunity for an interesting analysis. We've been down two consecutive days, for a total decline of -1.65% on SPY. When we've been down two days in a row for a drop in excess of 1.5%, what happens next? Since January, 2003 (N = 774), we've had 49 such two-day sequences. The next day, the market is up on average .14% (32 up, 17 down). This is stronger than the average one-day gain of .05% (430 up 344 down) for the sample overall. It thus looks as though a bounce is the normal expectation following two consecutive declines. When we divide the sample by time, however, a different picture emerges. During 2003 (N = 25), the two-day declines led to a next-day average price change of .38% (18 up, 7 down)--quite strong. In 2004 and 2005, however (N = 24), the average next day change has been -.11% (14 up, 10 down). If we look three days out, the pattern becomes even more pronounced. During 2003, the average change over the next three days following the two-day drop was .25% (15 up, 10 down). Since 2004, the average three-day change after a two-day drop was .08% (13 up, 11 down)--and in 2005 alone (N = 10), the average three-day change has been -.17% (3 up, 7 down)! What this is telling us is that early in the bull market, expectations following a two-day drop were quite positive, but these positive expectations have been eroding. At present, based on 2004 and 2005 results, we cannot say that there is a distinctive upside edge following a large two-day decline, and there is even modest evidence of continuation to the downside. Such sequential analyses of patterns are useful in identifying changing market cycles. This is very important. An upcoming article on the Trading Markets site will detail expectations when one-day declines are accompanied by very negative Adjusted TICK values. The Adjusted TICK is a staple of analysis on my personal site; it is the NYSE TICK adjusted to create a zero mean. The gist of the article is that days such as Thursday, which had a very weak Adjusted TICK and a decline in excess of 1%, have weaker expectations the following day than 1% declining days with stronger TICK readings. This, along with the relatively broad momentum weakness in the market, has me more cautious about the market upside than I would normally be after hitting a five-day low. (See previous entry). Thursday's decline came very close to one of those strong momentum declines that we recently explored, and that would have us looking for more downside. The key 500 difference between stocks with extreme negative momentum and those with extreme positive momentum, however, was not quite reached. As a result, I tried a different analysis: What happens after the market, like Thursday, declines by more than 1% and closes at a five-day low? Since the bull market began in 2003 (N = 728), we've had 55 days in which the market has dropped more than 1% and closed at a five-day low. Three days later, the market averaged a gain of .36% (35 up, 20 down), much better than the average three-day gain for the remainder of the sample (.17%; 396 up, 277 down). This finding of superior returns after X-day lows is similar to the findings from Larry Connors in his book "How Markets Really Work". Unlike strong momentum declines, which tend to persist in the short run, extended declines tend to reverse. Broad Momentum Rises: What Happens Next? Yesterday we saw that broad market declines--ones in which a large number of issues closed below the volatility envelopes surrounding their short-term moving averages--lead to further market weakness in the near term, while declines that are less broad are typically followed by reversal (as we saw in today's market). In this analysis, we'll look at the same broad momentum variable and see if it is relevant to market rises. Since March, 2003 (N = 724), we've had 37 rising days in which the difference between the number of stocks closing above their short-term envelopes and the number of stocks closing below their envelopes has been 500 or greater. Three days later, SPY has been up by an average of .58% (27 up, 10 down). This is much stronger than the average three-day gain of .11% (207 up, 158 down) for other rising days. Indeed, when the market is up on less than broad momentum, the average three-day gain underperforms the sample overall (.18%; 430 up, 294 down). What this suggests is that broad momentum leads to trend continuation in the short run, both to the downside and upside. Rising market days without broad momentum do not necessarily lead to market declines, but do offer subnormal returns in the near term. When markets rise on broad momentum, the moves tend to persist over the next several days.